All content in this blog is the property of the blog owner. We REQUIRE that you ALWAYS give proper credit and seek permission BEFORE using our images or content on your site. If you would like to share any post, pick ONE IMAGE and provide a direct link to the original post. Please do not remove any watermarks, crop, or edit any of the images. Thank you! 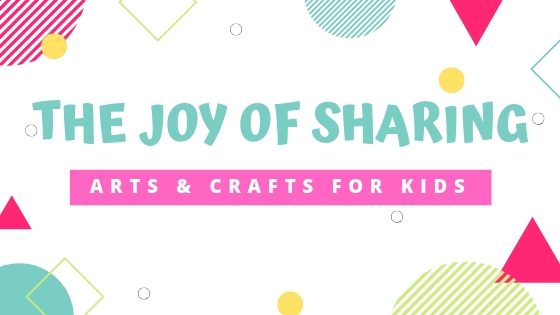 The Joy of Sharing is an online platform for sharing crafts and useful experiences. We share crafts, experiences, and learning activities for parents, teachers and children. Information is collected by the third-party web platforms via cookies and comments entered on the platform. 'The Joy of Sharing' uses Google Analytics to track website performance and user behaviour. It provides information on page views, referral sources, and other valuable information that helps us adapt the content we write for this website. Google Analytics does capture anonymous data about location, age, gender, and interests, but we have no way to connect that information and specifically identify you. Google Analytics may also capture your IP address as you make your way around this website. We configure google analytics to retain this information (user and event data) for 50 months. You can learn more about Google's data retention policy here. If you choose to leave a comment on a blog post, then please be aware that the comment is then public and is visible to anyone who reads the comment section along with the provided name. The web-platform may collect your email address. We do not have access to personally identified information outside of what's publicly shared on the third-party web platform. It is highly recommended that you avoid leaving detailed personal information in your comments. We reserve the right to remove comments deemed as inappropriate, threatening, profane, or spammy without notice. 'The Joy of Sharing' uses various social media platforms. 'The Joy of Sharing' is not responsible for what you post on The Joy of Sharing's social media channels. If you are under 18 years old, you must first have parental permission before using our website or entering personal information. 'The Joy of Sharing' contains links to other websites. As such, 'The Joy of Sharing' is not responsible for the privacy policies of other websites or the third party applications it uses. We share affiliate links (usually craft & kids related products/services) on The Joy of Sharing. On those occasions should you purchase the item through the affiliate link, we will receive a small percentage of the sale, which helps cover running costs of this site. The Joy of Sharing is a participant in the Amazon Services LLC Associates Program, an affiliate advertising program designed to provide a means for sites to earn fees by linking to Amazon.com and affiliated sites.